The market for plantation shutters in Honolulu is full of options. And when you’re researching which non-wood shutter is the best for your home, some differences may be tough to recognize. You can unknowingly choose the wrong type and end up buying low quality shutters. Are solid polymer shutters, like our best-selling Polywood® shutters, a better value than composite shutters? Find out the three ways Polywood shutters are a better choice than composite shutters in Honolulu, HI to help you decide. Polywood shutters are fashioned from a top grade solid polymer that results in the most durability, rigidity, and color-retention than any other shutter on the market. This way, the shutter louvers won't be damaged over time. In contrast, composite shutters are constructed from a pressed-board core, wrapped with poly-vinyl. The vinyl wrapping the pressed board also peels away from the core element readily. And this peeling happens even faster in wet, hot, and humid surroundings. Hollow vinyl shutters are another option for non-wood shutters. But they deteriorate the fastest in large part due to the material. Both types of non-wood shutters are likely to warp and deteriorate when you consider all the environmental conditions in Honolulu. Polywood is built with UV inhibitors that deflect heat. And because heat is the main offender in chipping the shutter louvers, Polywood is hands down the longest lasting plantation shutter for your home. Polywood shutters are available in three superior white paints. Our paint finishes are baked on each piece at temperatures hotter than it will ever get in Honolulu, HI. Our patented finishing process includes UV inhibitors to make sure the color will never fade. Other types of non-wood shutters are available in either low quality paint finish or no paint finish at all. In most cases, the vinyl wrap is the all the color you get. Although it looks good when installed, this finish fades over time. And when it comes to hollow vinyls, some are painted. However, with the material easily conducting heat, this negatively affects the finish as time goes by. Third party testing illustrates that Polywood shutters insulate against 30° of temperature and lead to reduction of heat transfer by up to 45%. With that, Polywood insulates up to 70% better than a similar solid wood shutter. It’s the heat blocking properties of the solid polymer material Polywood’s made of that make these plantation shutters so energy efficient. However what makes Polywood stand out even more from composite shutters is the weatherstripping on the panels and louvers. 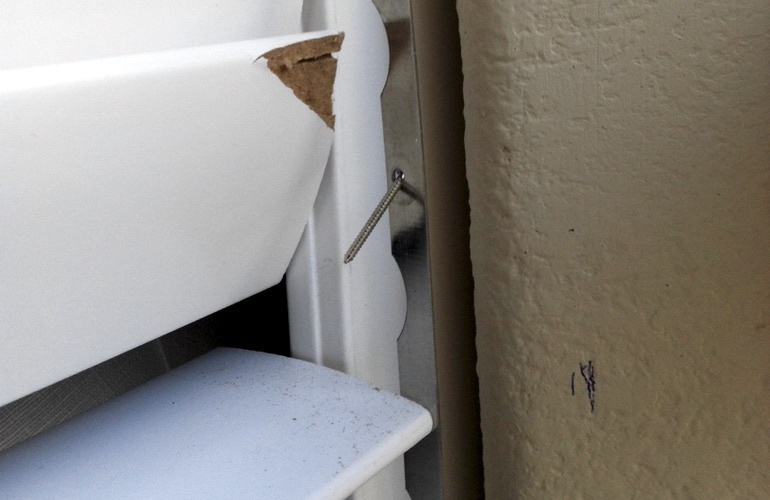 Just interlock the pieces of weatherstripping as you close the panels to get the tightest seal possible against the impact of the weather outside. No matter how far and wide you look, there isn’t a composite shutter that can give you the energy savings close to that of Polywood. In 2004, Sunburst Shutters Las Vegas had Polywood shutters fastened to the sides of their trucks as part of the graphics. The trucks were parked outside and saw the climate Las Vegas is infamous for. We’re talking excessive heat for almost five months each year! The plantation shutters had been fastened to our trucks for more than 7 years. Our team carried out a test on how well Polywood retained the color painted on it. So we wiped down the dusty Polywood shutter installed on the vehicle. And we held up a new Polywood shutter next it for comparison. The color hadn’t changed one bit. We didn’t see any discoloration or fading. This was further validation for us that this paint finish is the best in the market! And knowing that Polywood can handle all that heat and abuse on the road for more than 7 years, it’s undoubtedly the most durable shutter for your house in Honolulu, HI. Interested in learning more about Polywood shutters? Call 808-797-2004 for an in-home design consultation. Our experts bring you samples of all the frame styles, color options, and louver sizes available. We take measurements of your windows to present you the most precise shutter estimate. And we install your Polywood shutters so that they fit your window just right. Our professionals also explain the fine points of the lifetime warranty we provide for our shutters. Call 808-797-2004 or fill out the form below to schedule your free in-home design consultation today!